Please check at the cemetery office to see in which Chapel the service will be held. To get to the office, enter the cemetery on 6th Street (just north or Howard Ave.) and take the first road to your right and follow that road to the office/mausoleum building. You can give your memorial to the family directly. If are mailing your memorial and do not have the family's address, please mail to the Funeral Home business office, we will forward your memorial to the Family. Please address the envelope as listed above. Please scroll down for service information and online link for directions to the place of service. Born to Eternal Life Sept. 25, 2017, age 85. Preceded in death by her husband of 50 years, Donald; her parents, Edmund and Stella (nee Sadowski) Kondracki and her siblings, Dorothy Hamer and Jerome Kondracki. 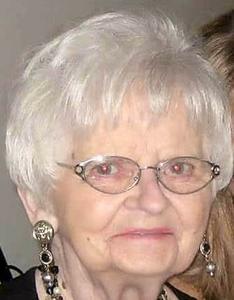 Cherished mother of Cheryl (Donald) Thompson and Jeffrey (Darlene) Czerwinski. Loving grandmother of Courtney Thompson, Rebecca (Dusko) Dronjak, and Erin (Nick) Tillman. Precious Busha of Shane, Madeline, and Lillian. Beloved aunt of Judy and the late Matt. Committal Services will be held at 12:00 Noon on Tues. Oct. 3, 2017 at St. Adalbert Cemetery Chapel, 3801 S. 6th Street Milwaukee, Wisconsin. In lieu of flowers, if desired, memorials to the Family or to the Wisconsin Humane Society are appreciated. Please use the bar at the top of this page to sign the online guest book, leave a memory or share a picture.